Birch beer in its most common form is a carbonated soft drink made from herbal extracts, usually from birch bark, although in the colonial era birch beer was made with herbal extracts of oak bark. It has a taste similar to root beer. 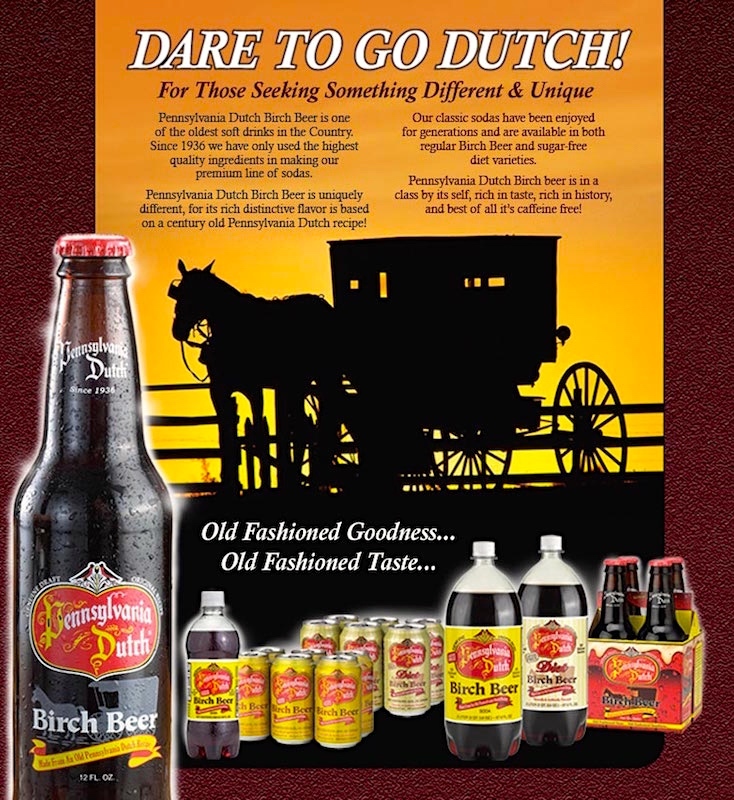 There are dozens of brands of birch beer available. Various types of birch beer made from birch sap are available as well, distinguished by color. The color depends on the species of birch tree from which the sap is extracted (though enhancements via artificial coloring are common presently). Popular colors include brown, red, blue and clear (often called white birch beer), though others are possible. This drink is most commonly found in the Northeastern United States [especially southeastern Pennsylvania], and Newfoundland in Canada. After the sap is collected, it is distilled to make birch oil. The oil is added to the carbonated drink to give it the distinctive flavor, reminiscent of teaberry. … Alcoholic birch beer, in which the birch sap is fermented rather than reduced to an oil, has been known from at least the seventeenth century. Root beer is also characteristic of Pa. Dutch country. Pennsylvania Dutch cuisine is the typical and traditional fare of the Pennsylvania Dutch. According to one writer, “If you had to make a short list of regions in the United States where regional food is actually consumed on a daily basis, the land of the Pennsylvania Dutch — in and around Lancaster County, Pennsylvania — would be at or near the top of that list,” mainly because the area is a cultural enclave of Pennsylvania Dutch culture. Pennsylvania Dutch cuisine reflects influences of the Pennsylvania Dutch’s German heritage, agrarian society, and rejection of rapid change. My Pa. Dutch grandmother made a number of these dishes, including bova shankel (with browned butter as dressing), but not under that name; I don’t recall the name she used, but I do recall that the dish was an enormous amount of work. This entry was posted on July 8, 2015 at 9:13 am and is filed under Language and food. You can follow any responses to this entry through the RSS 2.0 feed. You can leave a response, or trackback from your own site.